Something very exciting is happening in my backyard right now! 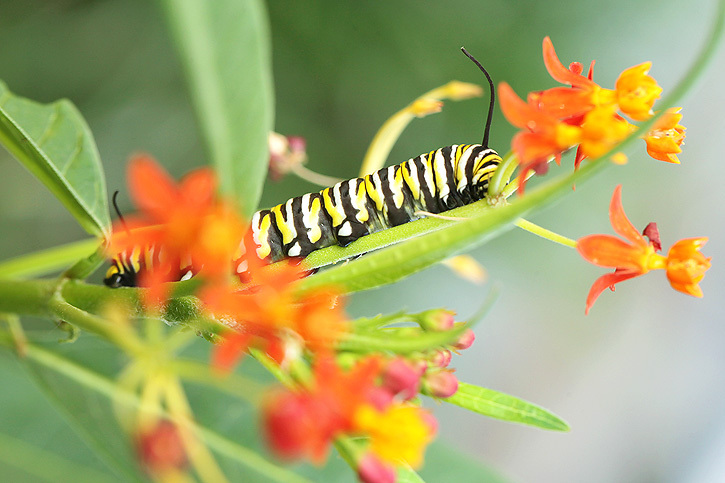 You see, I planted a milkweed plant last summer in hopes of attracting monarch butterflies. 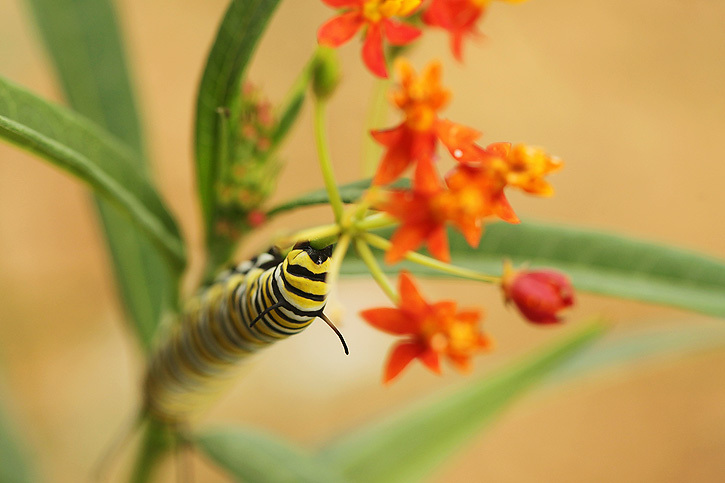 Milkweeds are the only plant a monarch will lay her eggs on. 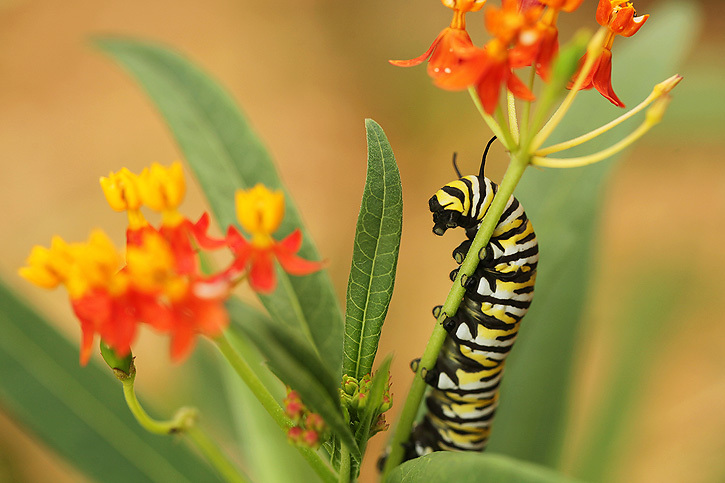 When the tiny caterpillars hatch, they eat the leaves of the milkweed until they are ready to find a place to form a chrysalis and begin their transformation. Last year we didn't find any caterpillars, but a few days ago I happened to look down and saw three monarch caterpillars on my milkweed! Hooray! I emailed my friend, Kim, who blogs at A Fresh Perspective because I know she has raised many monarchs in the past. She was so helpful and answered my many questions about how to care for the caterpillars. She recommended a bug habitat that can be purchased at Wal-Mart. By the time I went to get it and got back home, two of the caterpillars were gone. So I put the third one in the box along with some leaves for him to munch on. 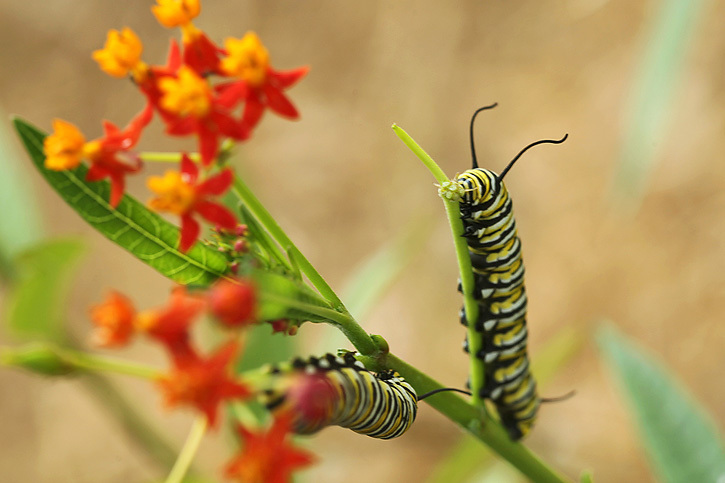 The caterpillars can crawl 20 to 30 feet to find a safe place to form their chrysalis. I was really hoping to find where the other two had gone so I told Mason I would give him $10 per chrysalis that he found. I didn't know it was going to be so easy! He found them both very quickly on the bottom of the brick window ledge that is near the milkweed. So we not only get to watch the one in the box, but also two under the ledge! I'm sharing updates on instagram and I'll also share the whole process in a few weeks on my blog if all goes well. For today, I have a few shots of all three of these beautiful caterpillars while they were still on the milkweed. I really appreciate all of you who link up! I always enjoy going through the amazing photos you share. Now it's time to see what you've been shooting this week! Here are the rules. That is so awesome!! They are much bigger than I expected! Can't wait to see the monarchs! I am so excited for you! That is fascinating!!!! : ) I laughed about your payment plan for finding the caterpillers : ) Funny! Very fun! I look forward to seeing the butterflies! Wow - these photos are amazing, Deb! I can't wait to hear an update! GORGEOUS detail!! I'm not a bug fan, but these pictures are amazing! what an amazing thing to do and how fascinating to watch these progress in to caterpillars! Sounds like your son made some easy money there! Wow. These shots are stunning Deb! I am not a bug person but WOW...those pictures are awesome! Amazing photos, Deb! I have been following the latest developments on IG - so cool! Oh how beautiful! you are so lucky - I can't wait to see what happens next! Beautiful photos! now I know why we never see any monarch caterpillars! But I totally am taking the kiddos the the forest preserve today b/c there is a plethora of milk weeds there! Wow Deb! These are just amazing! Can't wait to see the tranformation! Beautiful pictures in bright happy colors! Deb, those are beautiful! And, omg, I love butterflies, I think I'm going to have to plant some milkweed. Oh Deb, how neat!! These pictures are so amazing. Can't wait to see the next series. Exciting huh? I love the motivation you used to find them. I do that all the time with my boys. It really works huh? WOW! Exquisite shots and so exciting to be able to watch their progress through you! Wow! Your pictures are gorgeous! I'm so excited for you! Your milkweed looks different than ours. Ours has big wide leaves and pink/purple flowers. I love the orange flowers. Thanks for the shout out! So glad I could help! Beautiful! Huge beautiful caterpillars try to eat our tomato plants every year. I've never photographed them. Something new for this year! Those are great shots! Very beautiful! I never would have considered taking a picture of a caterpillar - mostly because I'd have a hard time getting up off the ground after taking the shot. Your imagery is so cool! Oh my goodness, these are gorgeous! I love the color you captured. So bright and bold. Very exciting, Deb! And great shots, wow! Can't wait to see your updates! That is so cool! I saw them on instagram, but now ia know the story behind the trio. Can't wait to see more! Oh my gosh- that is so exciting!!!!! I would love to do that. These photos are so gorgeous. Those vibrant colors just pull me in. I can't wait to see more as they transform. Oh what amazing photos are in your future! Oh my goodness, they are SO beautiful! We saw a monarch yesterday while hanging out on the front yard. Their just so big and gorgeous. I hope you're able to get pictures of those butterflies soon. Such an amazing transformation, really. Great shots of the caterpiller! So sharp and colorful. OH, how gorgeous! You captured them beautifully! I can't believe how colorful they are! I am in AWE! These are stunning. Just gorgeous. The color, clarity...um, everything. I can't wait to share them with my son whom I homeschool. He's going to go nuts over these! What amazing shots! The colors are so vibrant! They almost don't look real! Fingers crossed you'll soon have gorgeous butterflies fluttering by. love the light and color in these photos! That's great! Can't wait to see the progress!!!! THESE ARE AMAZING!!! How exciting. Good luck with your caterpillars! What beautiful photos, the colors are amazing! I can't wait to see the butterflies. That is SO cool, wonderful. wow! those images are lovely! love the vibrant colors and the crispness of the caterpillar! Whoa, these are just awesome! Gorgeous! These are the most breathtaking photos I have seen in a very long time- GREAT job! I just planted milk weed this makes me excited. How gorgeous are these. I love them!! How fun to watch, I'll be watching this process!! Oh Deb these are beautiful shots you got there. The colours in them are amazing. How amazing to watch these wonderful caterpillars!!! I am 'blown away' by the colour! Not to mention the subjects!! Nice to meet you and I believe I will 'stick around'! Beautiful photos. I, too, have milkweed in my yard. 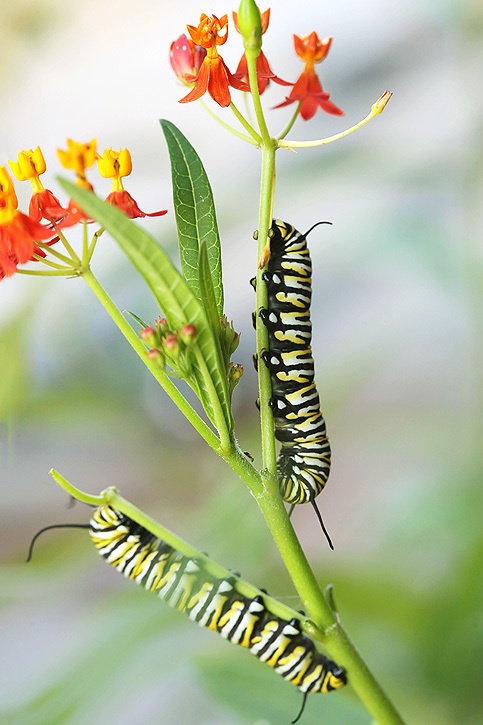 A couple of years ago, I had 36 monarch larvae on one plant--all at the same time. Last year, the crop was smaller. I'm hoping for good things this summer. Your experience gives me great hope! Incredible captures! Those shots are stunning! I would love if caterpillars visited out yard. I may need to make a trip to Wal-Mart. How exciting! Your photos are wonderful. Hope you have the joy of butterfly photos in a few weeks too. What beautiful images of the caterpillars, Deb!! I have loved watching their progress on Instagram. 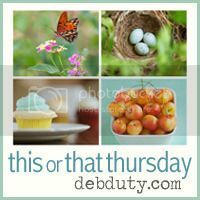 These are such inspiring photos with such vibrant colors! Nature is so alive this time of year and gives us creative energy and all sort of beauty to enjoy. I can't wait to see your images of the monarchs! Deb, these are just sss...stunning! I love every single one! wow, these are truly amazing shots!!!!!! the color and clarity is amazing! Unbelievable photos! I cannot wait to see what happens! Wow! Such amazing photos! The contrast of colors is just out of this world. The strong fiery reds and oranges against the yellows and black and whites are great. Some of the best I've seen! This is so amazing! They are very photogenic too ;0) Can't wait to see the butterflies.